Plasma can be classified in various ways such as based on temperature, pressure inside the reactor and electric signal. On basis of temperature of the ions and electrons, and degree of ionization plasma can be classified in two ways (i) Hot plasma (ii) Cold plasma. There is (i) Atmospheric pressure plasma and (ii) Low pressure plasma when plasma is classified on basis of pressure. Also, plasma can be classified into A.C. and D.C. based on electric power sources used. Among the various kinds of plasma, only cold plasma can be used for the textile modification. The research group is working on textile modification using indigenously developed atmospheric pressure glow discharge cold plasma reactor. The reactor has also been modified for continuous treatment of textile substrates. 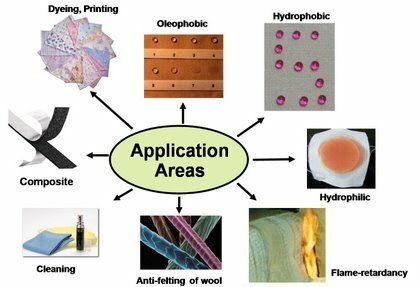 Current research fields are hydrophobic to superhydrophobic finishing, improvement in hydrophilicity, adhesion, dyeability and printability of the textile materials, in-situ synthesis of nano particles and eventually achieving novel properties on textile. Alteration in dye behavior of wool fabric using He plasma. Dye uptake of wool fabric increases after helium plasma treatment. Hydrophobic functionalization of cellulosic textile using He/non-fluoro carbon compound plasma treatment. Fluorocarbon compound is known compound for hydrophobic plasma treatment but it is hazardous to health and environment. Our group has been used different nonfluoro compound like butadiene, styrene, dodecyl acrylate and hexa methylene di siloxane to make the surface of textile from hydrophilic to hydrophobic in nature. Figure : Water drop shape on (a) untreated (b) plasma treated–soap washed fabric. Hydrophobic functionalization of viscose fabric was carried out using long chain hydrocarbon compound dodecyl acrylate (DA). The treatment was carried out in-situ using DA/helium atmospheric pressure plasma at low frequency. After the treatment, the water absorbency time of the substrate was more than 1 h and water contact angle was 143°. The functional property developed after the treatment was durable to both solvent and soap washing. Effect of various parameters such as concentration of precursor, helium flow rate, discharge voltage, discharge frequency and treatment time on functionalization was investigated. Figure: Images of water droplet on plasma treated (a) solvent washed (b) solvent and soap washed fabrics. Table: Water absorbency time & water contact angles of viscose fabric treated at different discharge frequencies Table: Effect of discharge voltage on water absorbency time and water contact angle of plasma treated viscose fabrics. Cotton fabric was treated using styrene/helium glow plasma at the atmospheric pressure. After the treatment, the substrate was found to turn into a highly hydrophobic material showing water drop disappearance time of 60 min and water contact angle of 133o. The treatment was found to be durable even after vigorous washing. The effect of various parameters, such as discharge voltage and frequency, on fragmentation of styrene inside plasma zone was investigated using optical emission spectroscopy and GC–MS. With an aim to improve water absorbency of the textile substrates, nylon and polyester fabrics were treated continuously in an atmospheric-pressure-glow-discharge-plasma produced in presence of different gases. After plasma treatment, time taken in spreading a water droplet over a pre-defined area was found to decrease significantly.However, the rate of oil absorption (a hydrophobic fluid) was also found to increase to a great extent. Spreading time for mustard oil droplet over a specified area was observed to decrease significantly from 152 s in an untreated fabric to 52 s in He plasma treated fabric for nylon, whereas, it decreased from 28.6 min in untreated fabric to 2.8 min in the treated fabric for PET samples. The effect of plasma treatment on the rate of oil absorbency was further confirmed for cotton fabrics, where the time for oil absorbency decreased from 59.5 s in the untreated sample to 30.4 s in the treated sample. Hydrophobic synthetic textile substrates, nylon and polyester fabrics, were continuously treated in an atmosphericpressure-glow-discharge-cold-plasma reactor using He and air. The samples were evaluated for antistatic properties by measuring the static charge build-up and half charge decay time. The 60 sec air-plasma treated nylon fabric produced only 1.53 kV of charge and showed a significantly smaller half decay time of 0.63 sec compared to static voltage of 2.76 kV and a half decay time of 8.9 sec in the untreated nylon fabric. In comparison, the He plasma treated nylon fabrics showed relatively less improvement by producing static charge built-up of 2.12 kV and half charge decay time of 1.1 sec. Similar improvements were obtained for polyester (PET) fabrics as well. The treated samples showed good antistatic properties even after five laundry wash cycles.The results revealed that the improvement on antistatic properties are attributable to increase in the surface energy of the fabrics due to the formation of hydrophilic groups and increase in the surface area due to the formation of nano-sized horizontal and vertical channels on the fibre surface. In this study, a stable glow plasma was generated at atmospheric pressure in the mixture of gaseous reactive monomer-1,3-butadiene and He and was made to react with cellulosic textile substrate. After 12 min of plasma treatment, the hydrophilic surface of the cellulosic substrate turned into highly hydrophobic surface. The hydrophobic finish was found to be durable to soap washing. After soap washing, a water drop of 37 μl took around 250 s to get absorbed in the treated sample compared to < 1 s in the untreated samples. The plasma modified samples showed water contact angle of around 1340. Both top and bottom sides of the fabric showed similar hydrophobic results in terms of water absorbency and contact angle. The results may be attributed to chemical reaction of butadiene with the cellulosic textile substrate.